Join us for a visit to the Tower of London - we promise not to have you locked up by a Beefeater! 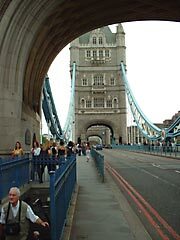 We started with a walk over Tower Bridge to get to the Tower of London and once there enjoyed an entertaining guided tour by a Yeoman Beefeater guy. ...our friend Bob showing Belinda his new digital camera. The weather looked a bit dull, not good with only a few weeks to go until mid-summer! 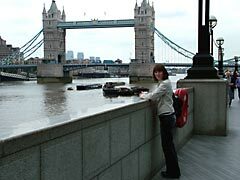 ...over Tower Bridge to get to the Tower. Half way over the bridge we stopped and looked across to the Tower and imagined what it was like in the olden days. That modern pointy building is the Gherkin in the City of London. 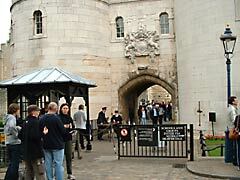 The entrance to the Tower of London cost £13.50 at the time of our visit. Once inside we met a stately looking Beefeater who showed us around. Mike would like a job where he gets to eat all day too! 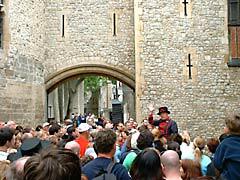 We were guided round the Tower by this Yeoman Warder (or Beefeater) guy who kept his audience well amused with lots of witty snippets of intriguing information. 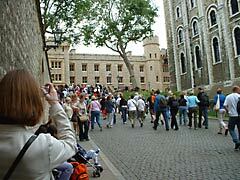 At this point we were about to walk under the Bloody Tower, while behind us was St. Thomas's Tower and Traitors Gate. Of course there were plenty of photo opportunities as we wandered round the Tower of London. And as you can see, we weren't the only tourists. The engaging Beefeater guided tour lasted about an hour and included the Chapel Royal - where the Beefeater straddled the exit awaiting tips! Er mate, your flies are undone! 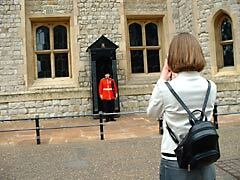 This guard was guarding the Waterloo Block where the Crown Jewels are kept - better not nick them then! 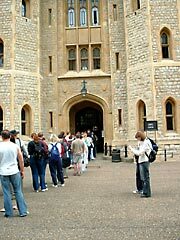 We joined the queue and saw the Jewels, but unfortunately photos weren't allowed inside this part of the Tower of London. 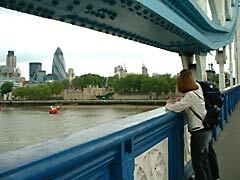 See our many London tourist resources. We've also visited the Tower Bridge Exhibition and Lewes historic town.